So.. This is actually a last-minute thing! 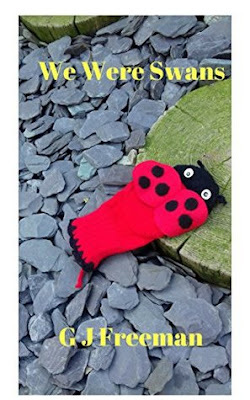 I noticed my review of We Were Swans to be pretty popular. I received an email from the author, G.J. Freeman, just now. On Inkitt there are 100 e-book copies available for free. So if my review spiked your interest, you can get one over there!! Let me know if you took the opportunity and share your opinion if you did read the book! Go over to Inkitt, sign in with Facebook, Google or E-mail and get a free copy; here. Tom and Sacha are ordinary people. They have no special skills which they are forced to resurrect, they aren't retired CIA or former Assassins. There are no puffs of smoke, no trapdoors, no sliding walls to swish magically open revealing a startling array of weaponry. They are normal people, like you and me. Until their 3 year old child is abducted and murdered by teenage freaks, as a game, a joke, or at least, that's how it played out in court. In the style of the feral underbelly of modern society, these vile, sick delinquents even film what they did on a mobile phone. Eight years later, they're out, their debt written off, ready to begin their lives as blithely as they destroyed yours. That can't be how this ends. If it were me and I were given the opportunity offered to Tom, would I take it? Yes. In a heartbeat. Could I do it? I'd like to think so. But here's the thing. Would you? Could you?